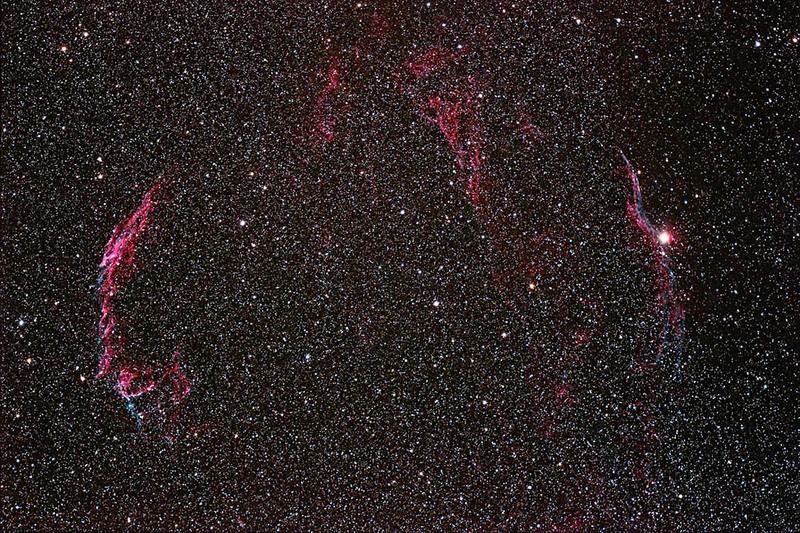 The Veil Nebula, also known as the Cygnus Loop, is a large complex of nebulae resulting from a supernova that occurred between five and eight thousand years ago. It currently spans 3x3 degrees of the sky, approximately six times the diameter of the full moon. It was discovered by William Herschell in 1784. The section to the right is NGC 6960. It passes through the bright star 52 Cygni. The section to the left is NGC 6992/5. The nebulosity at the upper right is NGC 6979; this is also known as Pickerings triangle. The fainter nebulosity to the left of NGC 6979 is NGC 6974. This was first light for my William Optics Star71 refractor.